A handcrafted quilt, pictured at left, made by library staff members will be raffled off during a book sale sponsored by the Friends of the Wesleyan Library May 13. The Wesleyan community can book some time at a library benefit this month. Friends of the Wesleyan Library, a volunteer group dedicated to supporting the library, will hold a book sale in the Exley Science Center from 10 a.m. to 4 p.m. May 13. The center will be filled with over 10,000 books for sale. It’s a perfect opportunity to find research, pleasure, gift or treasure books at a great price and build your own collection, says Christina Trier, co-chair of the Friends of the Wesleyan Library book sale committee. This is Wesleyans first major book sale in 20 years. Books have been withdrawn from Wesleyans four libraries or selected from private donations and sorted into 35 categories including art, science, literature, foreign language, religion, biography, philosophy, politics and history. Some books are new. Prices start at 50 cents for paperbacks and $1 for hardcovers. Special titles will be priced $5 and up or sold through silent auction. 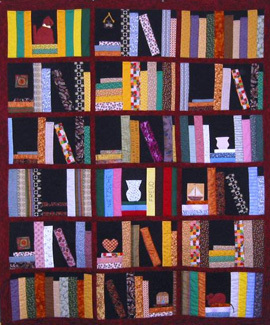 A handcrafted quilt made by library staff members will also be raffled that day. Book sale committee co-chair Greg Petropoulos says this sale is a great opportunity to promote the Friends of the Wesleyan Library, which was revitalized two years ago. We hope the sale will bring together people who enjoy books, while helping to raise funds to initiate special preservation projects or catalog currently inaccessible collections in the library, he says. The sale is open to the public and admission is free. For further information about the sale and the Friends of the Wesleyan Library, go to www.wesleyan.edu/libr/friends/index.html or contact Jennifer Hadley at jthom@wesleyan.edu, or call 860-685-3897. If you would like to volunteer to help at the sale, please contact Christina Trier at ctrier@wesleyan.edu. Interim Vice President for Finance John Meerts has become Wesleyan’s permanent vice president for Finance and Administration effective May 1. Meerts has responsibility for the Offices of Finance, Human Resources, Facilities and Legal Affairs. The Board of Trustees will act on a resolution to appoint Meerts as treasurer of the university at its annual meeting this month. In addition, he will continue his oversight of the Office of Information Technology Services, which he has led since coming to Wesleyan in 1996. 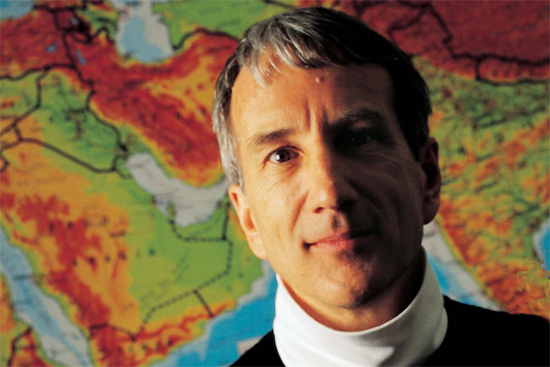 Meerts joined the Wesleyan administration in July 1996, from Yale, where he had been director of administrative systems since 1991. As director of information technology services at Wesleyan, he led a substantial overhaul of the organization, as well as the university’s technology and applications. He became vice president for information technology in 2002. After Vice President for Finance and Administration Marcia Bromberg retired in July 2005, Meerts assumed interim responsibility for Wesleyan’s finances. His permanent appointment follows a national search for Bromberg’s successor. Careers@Wesleyan, a new online career opportunity site, will replace the paper based employment process at Wesleyan. The Human Resources Department began using Careers@Wesleyan April 19 to help automate the employment process. Careers@Wesleyan provides online access to applicant information from any computer with an internet connection. The service will provide such enhancements as online review of the requisition approval process, capability to ask job specific prescreening questions to assist in developing a pool of qualified candidates, and online storage of applicant files to support a paperless process. Job applicants will be able to view each position description online, establish a secure password protected file to maintain or update their profile and apply to positions from any computer with internet access 24 hours a day. Careers@Wesleyan is designed to address the needs of staff recruitment and to provide new technology to enhance the employment process, explains Dan Pflederer, Human Resources Management System functional specialist. To access the site, visit http://careers.wesleyan.edu. 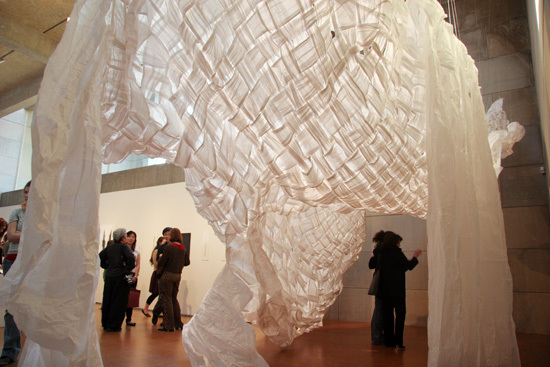 ARTISTS’ STATEMENT: The Senior Thesis Exhibition is on display in the Center for the Arts Ezra and Cecile Zilkha Gallery March 28-April 30. 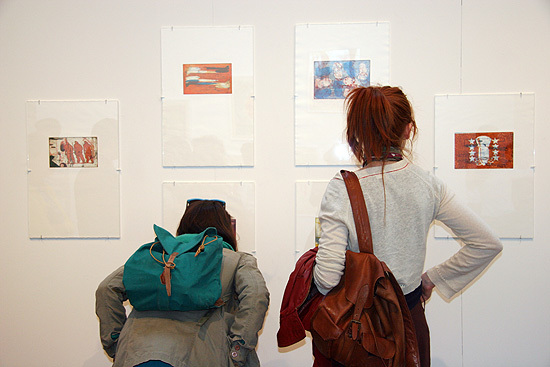 Pictured is the exhibition’s opening March 28. 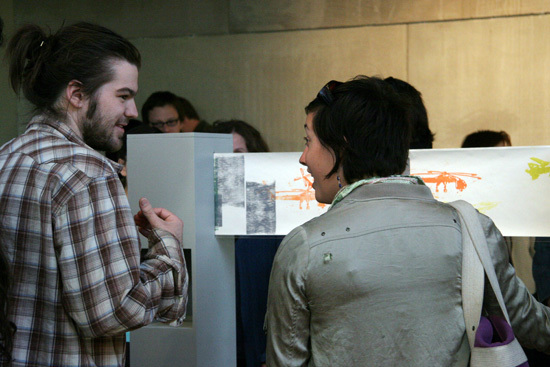 Raphael Griswold 06 left, talks to another student about his scrolling artwork. The public is invited to come view the talents of the seniors in the Studio Art Program of the Department of Art and Art History. 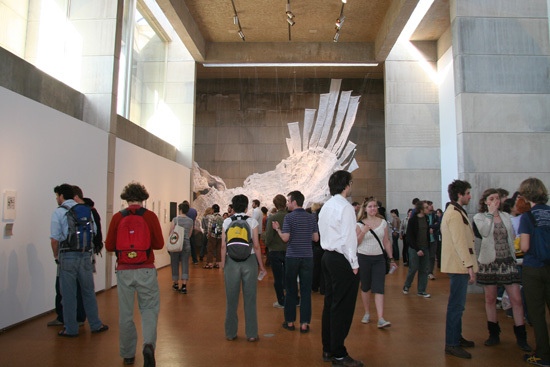 The exhibition is open noon to 4 p.m. Tuesday through Sunday and admission is free. Gary Yohe, the John E. Andrus Professor of Economics, suggests that the government place a growing tax on the cost of carbon during a hearing March 30 in Washington D.C. When Gary Yohe, the John E. Andrus Professor of Economics, received a call from Senator Joseph R. Biden’s office to testify before the U.S. Senate Committee on Foreign Relations in Washington, D.C., he didn’t hesitate. In fact, he hurried. In a five-minute prepared opening statement, Yohe called attention to the sources of economic cost attributed to climate change and suggested that government respond by placing a permanent and growing tax on the cost of carbon. The point of such a tax (or any policy that would add the climate cost of carbon to the price of oil) is to hedge against, or reduce the likelihood, of the extreme consequences of global warming. Yohe says he believes Senators Biden and Richard G. Lugar seemed to agree with his testimony. According to Yohe, Senator Biden said that people might get used to paying a persistent tax on petroleum. Biden was particularly interested, though, in how such a charge might be factored into the investment decisions of American businesses as they frame the energy infrastructure for the next half-century. Verlyn Klinkenborg, a writer and professor of literature and creative writing at Fordham University and Harvard University, will deliver the Earth Day address The Purpose of Nature at 8 p.m. April 20 in Memorial Chapel. A reception and book signing immediately follow in the Zelnick Pavilion. Verlyn Klinkenborg is the author of Making Hay, The Last Fine Time, The Rural Life, and Timothy: Or, Notes of an Abject Reptile, and many magazine and newspaper articles. A modern Thoreau, his lyrical portrayals of rural living and nature captivate our imagination while delivering a critical message. He is a member of the editorial board of The New York Times. His visit is sponsored by the Robert Schumann Environmental Studies Program. Information Technology Services and the Office of Environmental Health and Safety are teaming up to promote a clean and safe environment by hosting a recycle day. Anyone with old computer terminals, monitors, televisions, printers, keyboards, ink jet cartridges, or other computer parts can place them at a designated area on the Exley Science Center loading dock between 9 a.m. and 5 p.m. April 17-21. For more information contact Bonnie Penders at 860-685-3096. In addition to Earth Week, Wesleyans Earth House residents are organizing Food Politics Week, celebrated April 22-29 on campus. They will offer a soy workshop for making tofu and soymilk; a bread baking workshop; a dumpster-diving workshop; a farm workday; an edible plants walk with Michael Singer, assistant professor of biology; and a lecture on organic farming. Their observation will conclude with Veg Out on April 27, a home-cooked, primarily local, organic vegan meal open to the Wesleyan community. The cost is $4. Brooke Duling 08 says the group aims to raise awareness about the political implications people take simply by choosing to eat certain foods. They will highlight the consumption of local, organic, vegetarian/vegan food and open a dialogue about how to access these foods. For additional information, visit http://www.wesleyan.edu/earthweek/ or contact Kathleen Norris, administrative assistant, Environmental Studies Certificate Program at 860-685-3733 or by e-mail at knorris@wesleyan.edu. Rachel Ostlund 08 sprinkles seedlings inside a shelter at Long Lane Farm. The farm is expanding this spring to a full acre. Pictured below are vegetables grown last year by the Long Lane Farming Club. Although Wesleyans Long Lane Farm Club uses organic methods to grow its produce, a little Miracle Grow  has been sprinkled on one aspect of their garden: its progress. The Long Lane Farm Club was created in 2004 so students would have a place to come together and learn about food security issues. What began as a 50-foot plot of flowers and vegetables will be expanded into a full acre this spring. The expanded cultivation area will increase the clubs produce, which is shared by Wesleyan students and the local community. 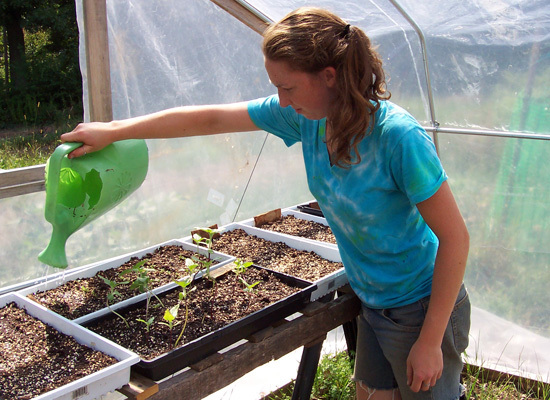 Maddie Thomson 08 got involved in the farm last spring, favoring the idea of organic farming. 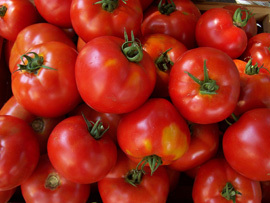 When a person buys a tomato at the grocery store, chances are, it was not locally grown, she says. The 50 members of the Long Lane Farming Club are thrilled to expand to a full acre. Knowing it will take extra helping hands, about 15 volunteers from the Wesleyan community have been recruited to help out with watering, weeding, pruning, mixing soil and other gardening duties. Almost all the work is done by hand. In addition, the club’s Community Supported Agricultural Project will have 10 members this year. These members support the garden by paying a fee, and every week for 10 weeks, they receive a share of the produce. Each pays $350, of which $150 is a donation to make produce available to food-insecure people. Members also participate in the distribution process by manning the tables every week to help pass out food to the other members. 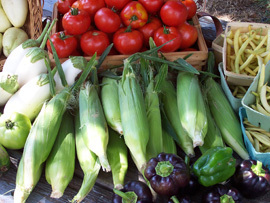 The club will have a farm stand in low-income areas of Middletown and can accept food stamps. Everything that doesn’t sell will go to soup kitchens. The Long Lane Farm has more than 80 vegetables and herbs grown in the two-year-old organic garden. 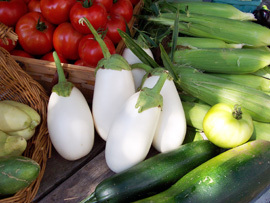 This includes tomatoes, broccoli, kale, carrots, lettuce, kohlrabi, beets, corn, beans, eggplants, zucchini, pumpkins, squash. New this year will be a garlic crop. The Wesleyan students have already planted seedlings inside their student residences. Once its warm enough, they will replant the seedlings into the garden. This summer the student farmers plan to hire four interns to work on the farm. Since the farm doubles as an educational tool for the community, the Long Lane Farm has partnered with Snow Elementary School in Middletown to get kids out in the farm to work, play, learn about farming and plants, and taste-test a few vegetables. In 2004, Rachel Lindsay 05 planted the first crops in a circular-shaped plot. Local residents rounded out the corners with garlic and potato gardens, among several flower beds. Lindsay, Rachel Ostlund 06 and other Wesleyan students later planted a tomato and broccoli garden, among rows of Swiss chard, pumpkins and squash. I just love that Long Lane Farm is a totally student-run farm, so that we get a chance to see and participate in all of the aspects of running it, Thomson says. The Long Lane Farm is funded by the Earth and Environmental Sciences Department, the Rockfall Foundation and personal donations. It relies on donations to pay summer interns and make the garden possible. For more information or to make a donation to the Long Lane Farm, e-mail longlanefarm@wesleyan.edu. Baseball player Jeff Maier ’06 has received national media attention this month for breaking Wesleyan’s career hits record. Jeff Maier ’06 a government major and third baseman on the varsity baseball team set the all-time record for most hits in a career against Bates College on April 12. During the game he finished 2-for-3, doubling twice, to give him 170 career hits. Prior to the game he posted four of the Cardinals’ 13 hits during a double-header with Middlebury at home April 9 to tie Bill Robinson ’03 for the team lead in career hits with 168. Maier’s achievement has been chronicled in more than 35 newspapers in the United States and Canada, including a front-page story in The New York Times. He has also been featured on local news and ESPN. The New York interest is particularly acute since Maier gained a measure of fame there 10 years ago for catching a ball hit by Derek Jeter of the New York Yankees during the American League Championship game. The ball was headed for the glove of a Baltimore Orioles player but Maier’s reach-over catch made it a home run and the Yankees went on to win the American League Pennant and the World Series. As of April 13, Maier ranks first on the squad with a .404 batting average. Wesleyan won the game, beating Bates 14-2. Baseball has been played at Wesleyan since 1865 when the university played its first game, which was against Yale University. 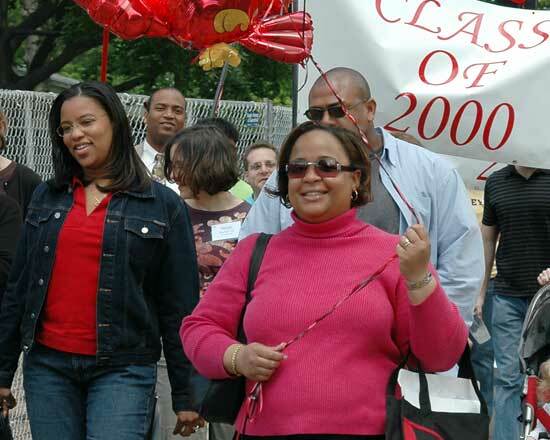 All alumni of color are invited to a reunion April 21-23 on campus. The reunion will coincide with WesFest so alumni have the opportunity to mingle with prospective students. Wesleyan’s alumni of color will have the opportunity to reconnect with each other and meet the newest generation of students of color during a reunion on campus on April 21-23. “We Are Family: Wesleyan through the Years” will allow fellow alumni of color to reminisce about five decades of Wesleyan’s distinctive history. It will also provide an insider’s glimpse of Wesleyan today and all of the renovations, enhancements and new improvements to student life on campus. During the event, which coincides with WesFest, alumni will spend time with students and prospective students and receive updates on new strategic plan, “Engaged with the World.” There will also be presentations by distinguished alumni of color, a campus tour and other opportunities to socialize. “The schedule includes something for everyone and we are delighted to welcome our alumni of color back to campus for an exciting opportunity to revisit with old friends and get a fresh perspective on the Wesleyan we love,” says Barbara Jan Wilson, vice president for University Relations. We Are Family events kick off on April 21 with a reception at the Rocky Hill Marriott, dinner with trustees in honor of former Dean of the College Edgar Beckham ’58. The program will include a welcoming address by Board of Trustee Chairman Jim Dresser ’63 and a DJ Party with Smokey Fontaine ’93. April 22 events include a breakfast and conversation with President Doug Bennet and Midge Bennet and a meeting with Sanford Livingston ’87, National Chair of the Black Alumni Council. The day also includes a presentation by Majora Carter ’88, a talk about the admissions process and a chat with current students about their Wesleyan and a career fair. April 23 includes a breakfast at the Rocky Hill Marriott and informal alumni gatherings throughout the day. Members of the Alumni of Color Network also will have the chance to meet with their councils during the weekend. The network includes the Asian Pacific American Alumni Council, the Black Alumni Council and the Latino Alumni Council. Each council develops events and programs that reflect specific interests and experiences of alumni of color. The network promotes interests pertaining to communities of color and collaborates with university offices to assist and support on- and off-campus programs. “This is a special opportunity to come back to campus in the spring, slow down, reconnect with old friends and make some new ones, says We Are Family coordinator Faraneh Carnegie, who is assistant director of Regional Programs and Networks and staff liaison to the Alumni of Color Network. We Are Family: Wesleyan through the Years is sponsored by the Black Alumni Council and the Alumni of Color Network. The cost to register is $50 for alumni and guests per person; $25 per person for Graduates of the Last Decade and their guests; and $10 for each child, ages 13-18. Childcare is available. 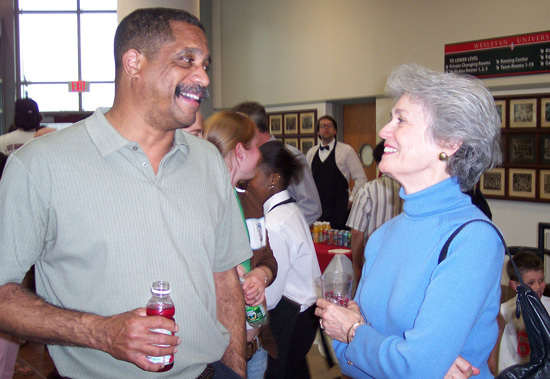 Above, Midge Bennet chats with men’s basketball coach Gerry McDowell during the Winter Athlete Reception April 13 in the Freeman Athletic Center. 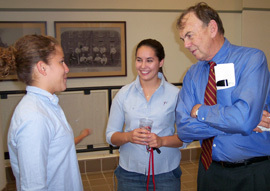 At right, President Doug Bennet speaks to winter athletes during the reception. Below, wrestling coach Drew Black, pictured on left, shakes hands with John Biddiscomb, director of Athletics. President Doug Bennet, Midge Bennet and John Biddiscombe, director of Athletics and chair of Physical Education, honored winter athletes at a reception in the Freeman Athletic Center’s Bridge Lobby April 13. President Bennet acknowledged all winter teams including men’s and women’s basketball, men’s and women’s ice hockey, men’s and women’s indoor track, men’s and women’s squash, men’s and women’s swimming and diving and wrestling. The teams members and coaches attended the reception. Bennet and Biddiscombe gave special recognition to stand-out student athletes. Bennet acknowledged this year’s recipients of Wesleyan’s Roger Maynard Memorial Award, presented annually to the outstanding male and female scholar-athletes. The winners were Hannah Stubbs 06 and Owen Kiely 06. Stubbs is captain of the women’s basketball team and has a 3.52 GPA. She will stay on at Wesleyan after graduation to get her masters. She is a three-time, first-team NESCAC basketball player. She is ranked number two on the all time scoring list. Last year, she was was an Academic All-American. Kiely, a cross country, indoor and outdoor track team member, has a 3.57 GPA. He won the 2006 New England Division III Championship and finished 14th at the Division III NCAA Championship earning All American status. The winter teams were lead by the women’s basketball team that had an 18-8 record and this team was among the top four teams in NESCAC and also participated in the NCAA tournament. The women’s basketball team was coached by Kate Mullen and assisted by Chris Lanser and Molly Dullea. The men’s and women’s swim teams also distinguished themselves. Bennet honored the men’s team for it’s 12-4 record and for finishing fourth in the NESCAC Championship. The women’s team had 12 wins and six losses. The swim teams are coached by Mary Bolich and assisted by Molly Parrish and Jeff Miller. Individual swimmers that qualified for the NCAA Championship were Ben Byers ’07 and Amanda Shapiro ’08. Shapiro earned All-American honors by finishing fifth in the 200-yard breast stroke and sixth in the 100-yard breast stroke. Two other Wesleyan athletes also distinguished themselves by becoming NCAA All Americans in indoor track. Bennet honored Ellen Davis ’07, who qualified for the NCAA Division III Championships in the 5,000 meter, where she performed superbly in finishing fourth in the nation. Wes Fuhrman ’05 also represented Wesleyan at the national meet, competing in the 5,000-meter and placed seventh in his last race of his college career. In addition, Ben Byers ’07 went to NCAAs for swimming and Dan de Lalla ’07 went to the NCAAs for wrestling but didn’t place. 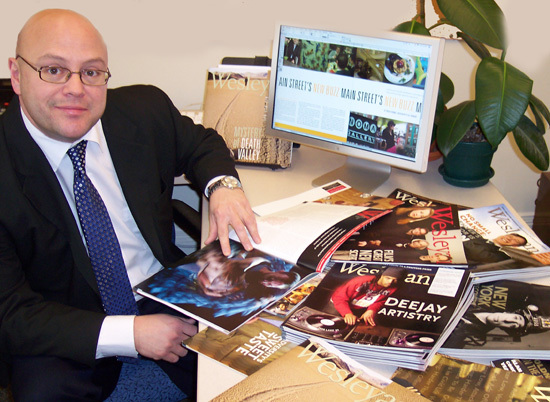 Steven Jacaruso, art director, designs the look and feel for Wesleyan magazine. Q: When did you come to Wesleyan? A: I was hired in July 1998 as the assistant art director. Later on I became the associate director, and then the art director in 2000 for the Office of University Communications. Q: How did you become interested in graphic design? A: When I was a kid, I was always into drawing and I was intrigued by logos and full-page movie ads in the New York Times. Ive always had my eye on the visual aspect of things. Back then, graphic design wasnt a common career, so after high school I went to business school, which led me to the University of New Haven where I studied graphic design. Q: Do graphic designers have a distinct style, as would an oil painter or writer? A: Some do, but I try hard not to have a style. I like to approach each project with an open mind because one style is not applicable to all problems. Q: How has your job changed in your eight years here? A: My first year here, I was doing a lot of budgetary work and handling the production aspect of things, as well as most of the design work. When I was promoted to an associate director, my responsibilities grew and when I became the art director, it became my sole responsibility to design the Wesleyan magazine, which was something Ive never done before. Q: I imagine that was a big challenge. A: I was basically handed a magazine and it was a challenge to learn the process. I had to keep true to the Wesleyan message while implementing my own design elements. It is a constant evolution. Q: When you say design elements, how do you use them to keep the magazine cohesive? A: On a visual level Wesleyan magazine is all about great images  images that are a step above most alumni magazines. I use color and layout to enhance the visual appeal of the images. I do the same with typography. I like to experiment with type settings and headlines that will draw a reader into the story. I dont like my design to overshadow the main purpose of the magazine, which is to report on successes of our alumni. Q: You designed the Wesleyan logo, correct? A: I refreshed the existing Wesleyan logo. It was time to move into a new direction with the logo. We wanted to move it into the new millennium without sacrificing its historical relevance. The shield is used sparingly as a nod to tradition. The new logo treatment has been very well received and works in many different mediums from campus signage to print publications. Q: How long does it take to get the magazine designed and what goes on? A: Its about a three month process for each issue from beginning to end. After our initial meeting, I see what stories the writers will be working on and I begin creating the color pallet and templates for the issue and determining the amount of real estate dedicated to each section and feature. Stories that are longer, or the most significant, or have quality images, get more pages in the magazine. Then I meet with Bill Burkhart, the university photographer, and we discuss what images need to be taken. I lay out the magazine and we go through a month and a half of critiques. I take all comments, positive and negative, into consideration. Q: What is your reaction when a magazine is finally finished and you get your first peek at the printed product? A: Since we only publish four times a year, I am always happy to see it designed, trimmed to size and published. But being a perfectionist, I go through it page by page and notice little things that we couldve done differently. Im always striving for perfection in each issue. Q: In addition to the magazine, what other publications do you design? A: I oversee all creative for most of the publications. When a certain department needs to be folded into the Wesleyan brand, such as Wesleyan Annual Fund for Excellence, campaign and most recently the timeline exhibit that will be unveiled at Reunion and Commencement weekend, I usually take the lead. Sometimes Ill start a design and set up the specs, and hand it off to Anne Marcotty, our senior designer, or Shelley Burchsted, our production manager, who will have our student interns work on projects. Q: Where did you work before Wesleyan? A: I started out working for my fathers computer business, then I worked at a t-shirt company, a newspaper, and then I got into the music industry. I designed CD covers for artists like Richard Elliot, Barbara Mandrell, Bon Jovi, the Allman Brothers and Lynyrd Skynyrd, and then art directed a small record label in New York City. The music industry isnt real consistent and seemed really one-dimensional to me, so I wanted to push myself outside of my comfort zone and open my own business in Waterbury. I worked on a lot of civic-minded projects for the community with the local Chamber of Commerce. I had to do it all, from the budget to production to client relations to design. This enabled me to hone my business skills, which helped when I started at Wesleyan. Q: Why did you want to work in academia? A: Being in a university is a nice blend of my experiences and I can be creative but also business-minded. I get to do projects for alumni and external audiences, but also for students, which have a youthful element to them. Q: How do you keep your design ideas fresh and creative? A: I am submerged in the design world. Im always reading design magazines, and when I read other publications, Im always looking at how they are designed. I tend to surround myself with people who are very creative and through that I find inspiration. In college I was trained by a professor who learned design in Basel, Switzerland and Yale University. We never had computers so we designed everything in a very organic way. I learned a lot by that method. Computers are a tool. They do not make a good designer. A: Graphic design is my hobby and I have turned it into a career, but I also like working out, yard work, hanging out with friends and family, watching movies and listening to music. Music has been a big influence in my life. I always wanted to be the guy who advises the careers of music artists. Who knows, I still might do that one day. 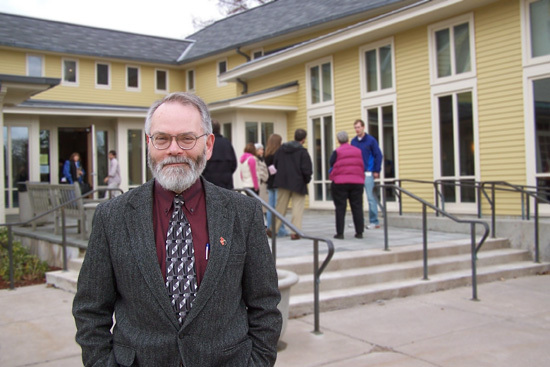 Greg Pyke, senior dean of admission, stands outside the Office of Admission. Every year, the Office of Admission begins with a prospective student pool of over 30,000 and mails information to another 88,000 based on PSAT and ACT scores and grades. Of these, about 7,000 apply, and after review, this number is whittled down to less than 2,000. Of this amount, ultimately, 720 of the applicants will become Wesleyans newest freshman class. As a senior associate dean of admission, Greg Pyke reviews hundreds of these applications, and he meets almost as many potential applicants each year. Hes currently preparing to welcome the Class of 2010. But the process that got these students here is long and exacting. Pyke and 10 other admissions personnel divvy up all the applications. Each one must be reviewed at least twice before acceptance or denial is granted. This year, Pyke and Leah Kelley, assistant dean of admission, reviewed applicants from northern New England states, eastern Massachusetts, Colorado, Oklahoma, Texas, Arizona, Africa and Europe. Each application is scrutinized not only for test scores, grades and achievements, but also for traits that show the applicant would benefit from Wesleyan’s educational program and environment. We want our student body to have variety, so were looking for students who have a combination of talents, experience, unique backgrounds and opinions, and who have demonstrated social involvement, Pyke explains. Nancy Meislahn, dean of admission and financial aid, determines which students are accepted. Pyke seems to have a new job for every season. In the fall he travels to schools across the country and the world, meeting prospective students and parents. In winter, Pyke begins the process of going through the stack  the hundreds of applications  with special attention paid to those applying for early admission. 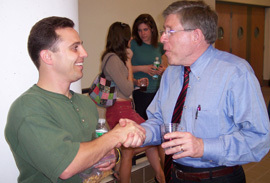 In spring, Pyke concentrates his efforts on convincing the accepted students to choose Wesleyan through WesFest and face-to-face conversations. By June, the incoming frosh class will be announced. In the summer, Pyke is busy meeting and speaking with campus visitors, compiling statistics on the incoming fall class, and planning his next year. The process is cyclical year to year, with new changes and challenges implemented every season. Never knowing what is coming next and wondering what questions or concerns will arise the next year is one of the biggest reasons I enjoy working in the Admission Office, says Pyke, who has been a member of the department since he started in at Wesleyan 1978. And as for this years frosh, Pyke reports that the Class of 2009 comprised 6,879 applicants, of which 1,902, or 28 percent of those who applied, were admitted. Of the 1,902, 71 percent were ranked in the top 10 percent of their high school class; 13 percent are the first generation in their family to go to college; 79 percent live outside of New England; 41 percent are students of color; 77 percent have taken biology, chemistry and physics before entering college; and 76 percent had studied a foreign language for at least four years. Pykes responsibilities have grown over the past 28 years. He previously handled the transfer student admission process, and later the senior interviewer program. Hes currently the statistical information reporter. In this role, Pyke generates class profiles for the university, public media and the Integrated Postsecondary Education Data System, designed to collect data from all primary providers of postsecondary education. He reports on the total number of students accepted, students of color, geographical information, average SAT and ACT stores, among several other factors. In addition to reviewing college applications and collecting and reporting statistical information, Pyke collaborates with Joan Adams, assistant to the dean, on the High School Scholars Program. Through this program, local high school seniors have the opportunity to take classes at Wesleyan with no tuition charge. They attend classes with Wesleyan students, and are graded on the same scale as a college student would be. Of the 23 high school scholars who applied this past academic year: 15 were accepted into the program and enrolled in courses either in the fall of 05 or the spring of 06. Pyke knows some of the emotions parents go though during the college application process. He and his wife, Karen Bovard 77, have gone through the procedure themselves with their two children Alan and Josh, who are both currently enrolled in college. Pyke also has an older daughter, Jenny, who was an interim class dean at Wesleyan and is currently in a similar, permanent position at Mt. Holyoke College.